That's Cool, That's Trash! : FLESH FEAST! UPDATE: There was an issue with the episode's feed which has been corrected now, so you can find it in iTunes or in the direct link. Matt is joined by Joe Kincher and Devin Bruce to discuss Brad F. Grinter & Veronica Lake's 1970 movie FLESH FEAST. Movie maverick Grinter was just about to make the greatest Thanksgiving anti-drug, Christian screed ever BLOOD FREAK, but he was still getting his directing chops up with a biker movie and this little number. 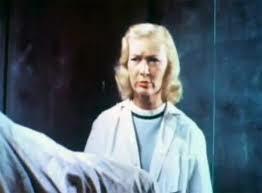 Poor Veronica Lake thought this movie would be her comeback and financed this nonsense story wherein she plays Dr. Fredrick a woman on the verge of using light-treated maggots to rejuvenate old flesh, even the flesh of the most hated figure in all the 20th century...but, I've said to much. So, prepare yourselves for the Reich that comes before the fifth one...I've said too much. DIRECT LINK. He's got to relive those awkward, zitty teen years...good! "Thank heavens there's nothing creepy in here!" "I'm not working with Coppola or Peckinpah next, am I?!?" NEXT UP: We have some more guests coming and will announce the movie here and on our Twitter account. Leave us some feedback in iTunes, won't you?